We cannot stress enough how crucial data backup is for protecting your business’ continuity. If your only backup is on a single desktop/laptop computer and disaster strikes – your clinic’s data could be lost forever. From natural disasters to intentional attacks from cyber-criminals to simple mistakes by staff members, there are numerous ways your data could be compromised, and any one of them could put your clinic in jeopardy if a proper system isn’t in place. When disaster strikes, every minute your team is without data is costing your business resources, money and customers! If losing the data will interfere with doing business – back it up. We’ve already talked about WSIB eServices Integration and the upcoming Online Booking modules in our latest release. But we’ve also added additional functionalities and features to our backup manager to help keep you informed and your clinic’s data safe. You can now set to receive email notifications after each scheduled backup job is completed or failed to complete due to errors. You can choose the types of notifications and who receives them. With email notifications, you are always in the know and can take appropriate action if anything goes wrong. To access this feature open Universal Office Backup Manager, select the Notifications Setting icon and complete the setup, or contact us for help. Cloud backups are secure offsite copies of data that are stored on remote servers and accessed via an Internet connection. They’re an excellent option for providing additional redundancy and security for businesses that want to ensure their important data is available if and when onsite or physical data disasters strike. But not all cloud backup providers are the same, which is why we’ve done the research so you don’t have to. We wanted to ensure you have access to a solution that meets your needs – IDrive. 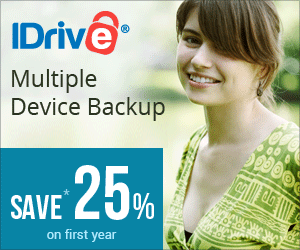 You can access the IDrive setup through your Universal Office Backup Manager. Just click the Online Backup icon to get started or contact us to arrange help with this setup. To learn more about why we stand strongly behind IDrive as our cloud backup provider – and why you should, too, check out Keep Business Data Safe – For Less Than $100 a Year! Don’t run the risk of losing your business data. The best defense against disaster is a sound data protection. By implementing a system that backs up your clinic data regularly, you’ll ensure that your business will be able to weather whatever storm it faces and carry on. Remember – you can never have too many data backups!